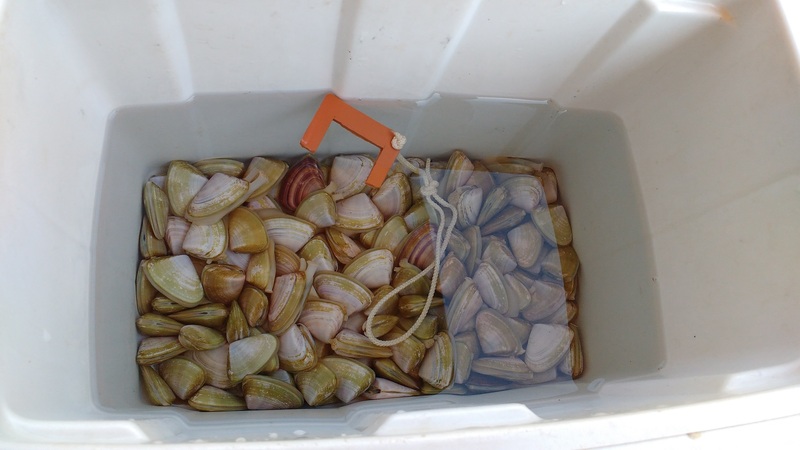 Went down to Goolwa on Sunday to collect some cockles for bait now that the season has reopened. The hot weather and light winds made it a perfect day for frolicking among the crashing waves. What was surprising was the average size of the cockles we were gathering, being well over 3.5 cm across (legal minimum size). Got enough to last a little while but well under our quota. Didn't take long because finding legal ones was so easy which hasn't been the case over the last few years. They're now packed and stored in the freezer ready for summer sessions. Thought I'd do it early in the season before PIRSA shuts it down yet again. We don't eat them anyway & I don't think fish are to worried so I don't see why bait collecting is stopped even if there is microbe contamination detected. Let's face you can get seriously ill from not cooking your food properly & bureaucrats don't monitor the contents of our fridge, anyway that's another story now we're all living in this post common sense world, nanny state, economic dictatorship! So those of you who like foraging for your own bait Goolwa beach seems to be providing good cockles this year. Bear in mind please just take what you think you're going to realistically use so there's plenty for all and plenty left over for nature to replenish itself. My thinking too was to head down earlier in the season, at least to take my son for his first shuffle. Don't actually want any for bait but might keep a few. Any particular distance down the beach or straight out the front? LocationAdelaide south / Stansbury Y.P. Very good to know Aff, thanks for posting up. Not a bad idea catching up for a cockle day @nosaj. @Doodlebug73 I don't have a 4x4 so have to leg it , but good news is they were pretty much right in front of the entrance to the beach from the kiosk. We went a bit to the right away from people swimming, surfing etc, found a bit of our own space and did the pippi shuffle. I think the further you go from the masses the more chance of finding them easier because people are generally a bit lazy walking further & so they're less are likely to have been taken further away. But you don't need to go far to find good ones at the moment. I don't know where you guys go for your cockles but here's where I used to get mine from at Goolwa..
Nice one Adrian. Never even knew you could get in to the beach past the main carpark (Beach Rd) ! If you want head even further west, you can try a spot at which I've previously had success a few years ago. It's at Middleton, just out from the car park near Bondi Place...lot less crowded as well. Took the young fella and my old lady down for a swim & cockling session today. 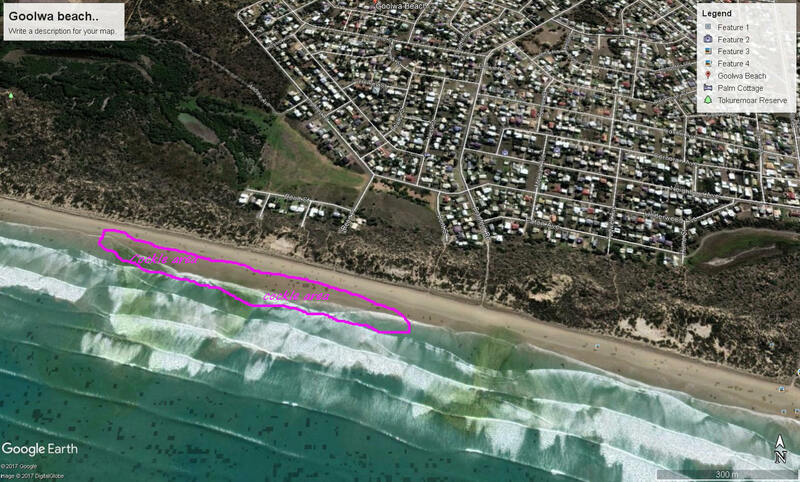 Wanted to try Adrian's suggested but went Goolwa's main beach instead - to do the right thing & swim between the flags . Arrived ~10am carpark was full, easily 50+ 4x4s parked up the beach towards the mouth. Beach pretty popular with families, grommets ect and a few other groups of 'cocklers' out. Given we were pretty close to the main carpark, things were a bit thin, as expected! Still managed 100 or so in a casual hr. Only measured a few and probably discarded a 1/3. I'm pretty good eye-balling sizes and also recon "if i have to measure, it's too small and can go back". Son was more interested in in digging holes, making sand castles and mucking around at his first true surf beach (apposed to West or Semaphore). Nevertheless i had him chasing some in the wash as i did the 'shuffle'. Left after 2.5hrs of hot sunshine. Almost mandatory d**khead bogged on the 4x4 beach access. (im no car person) looked like a Territory. Wonder if he thought he had a 4x4 but was only the 2x4 model? Was impressed that i saw one (but only 1 ) bloke dropping his tyre pressures. Nice to get down there UP and the kids to muck around too on the beach. New Years day was even worse UP for 4X4s and people in general, had to look both ways before venturing towards the water. Unfortunately the cockles in areas that are more easily accessed by foot are under more pressure and are thinning a bit. Good you managed some and had some fun with the family. Just under 2 weeks to go.... you'll certianly be beating the crowds. I'll be going when it opens, as I have run out of them in the freezer. never used a rake... just shuffle.. rake is higher return? Dave if you need some before then let me know, I have a few bags in my freezer you gave me last time left! I will be keen to go down, found minimal advantage over driving along the beach compared to by the kiosk though. You can get them pretty close to the carpark. No point unless you want to join the 4wd w**ker brigade, park 200m up the beach...and churn the sand up with your highway pressure cheese cutters! I've got a SUV and I normally head between 5 to 7 kms down the beach. You can just seem them rolling in the surf and there is no pressure from others. With the smaller limits though, you can definitely get them in good numbers without taking the car.